It's easy to spot Marvel fans. In The Tearjerkers Comic Book Heroes the band pretty much names all Marvel's big guns to a catchy beat, without a Kryptonian word. 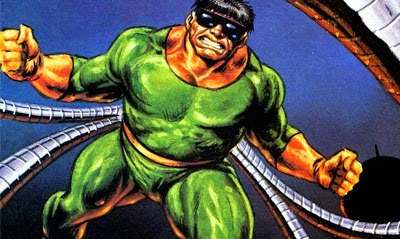 The Fantastic Four, Dr Strange, Magneto and Cyclops are all there, but for me they all lose out to Doctor Octopus. As a kid the classic Lee/Ditko Spider-Man villains ruled my world - which is still a mental trump card even at this ripe old age. ker-pow, sock, wham they're finito"
Never heard of this band until now, but I dig the hell out of the subject material. Gotta' admire a group that just boldly puts it out there they still want to be a comic book hero. You and both guys, you and me both. Thanks Dale. Each time I play it the hook sticks with me for hours... glad you liked it too.